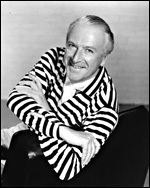 Harrow- and Cambridge-educated Cecil Beaton (born in London on 14 January 1904) made his name as a photographer of theatrical, royal and society luminaries. He began designing for the stage in 1935 and for films in 1941, winning Oscars for the flowing elegance of his costume design for Gigi (US, d. Vincente Minnelli, 1957) and My Fair Lady (US, d. George Cukor, 1964) and his art direction on the latter. His films were almost invariably set in high society - or in the demi-monde at least. He was made a CBE in 1957 and knighted in 1972. Famous for his portraits and idolatry of Greta Garbo , he was the author of seven volumes of autobiography and the subject of several biographies.